Years ago, I saw Francisco Goldman at the New York Public Library, in conversation with Junot Diaz. Goldman’s warmth and humor was everywhere that night, along with his intelligence and humor. When I asked him to be our guest fiction editor, I received that same generous response. And then his wife Aura Estrada died. He decided to dedicate his efforts to her. Read his essay to find out more. 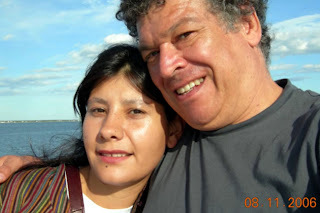 Picture is of Francisco and his late wife, Aura. Francisco took the picture himself. Everything as it always was, day after day, until the thunderous boom. As the projector unexplainably kept on rolling even after the house lights went up and the medics made their way to the front, some, apparently to the filmmaker’s credit as an artist and perhaps his detriment as a person, continued to watch and even laugh at the hazy antics on the screen. He should have been thankful that Xavi died when their friendship was still intact, still unconditionally generous, as strong as their youthful athletes’ muscles, as stubbornly perfect. The mirror needs to be hung up at a height of 18 feet. The four-foot stepladder we borrowed from the Weisses comes up nine feet short, and climbing the low-hanging branches has not been as easy as I first imagined. The bark leaves a slippery residue on my palms and the needles tear away as easily as leper hair. Those phrases, something has changed, just need to get away, personal vacation, were not really my words but TV words, movie words, pollen in the air. “I can’t study here.” Karenne’s hand waved loosely over the room. Augati saw the whole shabby truth of her life. The coffee table: a door, the handle still on poking up through the magazines that concealed the rest, rows upon rows of old magazines, many with missing covers, many marked and marred by grease, spilled coffee, forgotten bubble gum. Even the pillow she had picked up when she joined Karenne was bald, and it stank.